Fight back against busyness and celebrate the pleasure of doing nothing in this new guide that helps relieve stress and increase happiness in your life. In The Joy of Doing Nothing you’ll discover how to step away from everything you think you have to do and learn to live a minimalist life. Rachel Jonat shares simple strategies to help you stop overscheduling, find time for yourself, and create moments of calm every day. You’ll learn how to focus more on the important aspects of life, such as family and friends, and scale back your schedule to create more time in the day to care for yourself. "‘Less is more’ is not just a slogan; to Rachel Jonat, it’s a way of life … .Of course, The Joy of Doing Nothing is not really about doing nothing. It’s about liberating yourself from the sense of urgency that injects so much stress into everyday life. Jonat shows how to step away from the things you think need doing, so you can concentrate on what’s really important. Stop overscheduling, scale back and take care of yourself." "How many times do you say yes at your own expense? After all, technically, you do have the time. I love what Rachel Jonat writes in her new book The Joy of Doing Nothing on saying no. By saying no, you’re also being honest with the other person, and with yourself—which is important for both relationships." "We have become masters at multitasking. Rachel Jonat wants us to consider an alternative. Author of the intriguing new book The Joy of Doing Nothing, Jonat encourages readers to start small in the pursuit of doing nothing. By doing so, you will start to unwind your system, find rest more easily, and ultimately enjoy and engage in the important parts of your life more fully." "Rachel Jonat (theminimalistmom.com) makes a compelling case for calm in The Joy of Doing Nothing." 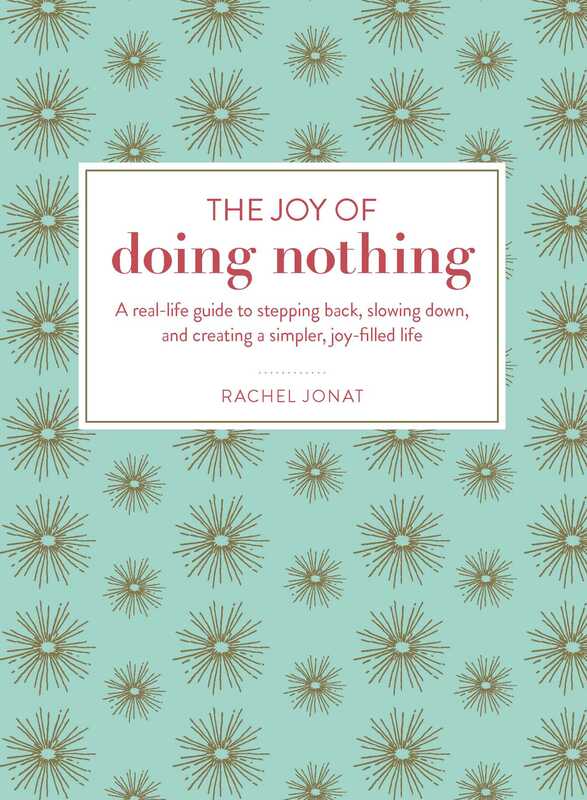 "The Joy of Doing Nothing by Rachel Jonat is such a pleasure to read, with nuggets of wisdom that build a compelling case for what most of us already know: Rest, quiet time, and doing nothing ultimately make us more productive, energetic and happy." "The name of the book alone piqued our curiosity from the get-go. This book, in essence, is telling everyone to bite the bullet and do it already—reclaim that time! The new, straight-forward read catalogs the numerous social, emotional, physical, and even work-related benefits of simply being. Jonat’s concept of ‘doing nothing’ is considerably open. Overall, it’s a chance to be still, connect deeply to yourself or someone else, and taking all of those little pockets of time in our lives and choosing ‘nothing’ over something." "As soon as I saw this title, I knew it was something that I wanted to read. Already a big fan of just taking time out to “be”; I long to spend more time without distractions … I loved the simplicity of the book’s cover … It’s filled with useful observations and thought-provoking tips, I’ve loved this book and there are so many tips I want to try." "You’ll learn to stop over-scheduling and make more room for yourself, your family and the things that truly matter." "Jonat evangelizes the power of ‘no.’ She encourages us all to say no to social obligations, no to extra chores, no to missing our own lives due to constant busyness. In your mind, re-frame ‘doing nothing’ as a form of self-care, not sloth."